What Makes A Good Song? 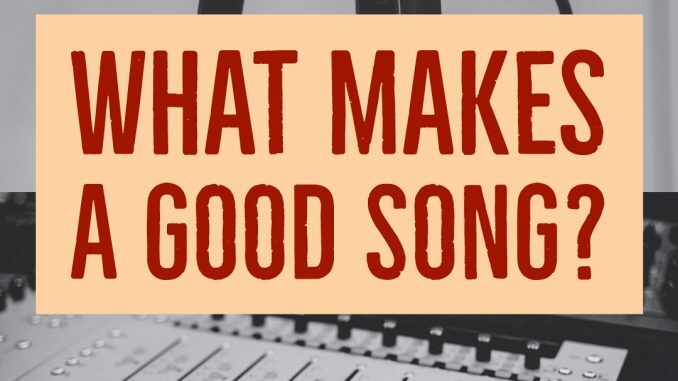 What makes a good song? It’s a big question though. Thus, “Good” is subjective. Essentially, one important quality of a good song is to have meaningful lyrics. You should also make meaningful lyrics, not necessarily too poetic or rhyming, but at least to touch the hearts of the listeners or music lovers. Moreover, a good song must connect with people. When you play a good song for someone, they are able to connect to it intensely. This means that the connection is what causes someone to love your song. For instance, if your song about the current state of the economy connects me to a time when I had no money, I’m connected and interested. Again, a good song causes a reaction. The listener is compelled to do something when they hear a good song. It might cause them to dance, laugh, cry, sing, rap along – but they will do something in response to a good song. It’s almost impossible to avoid reacting when you hear a well written, good song. A very good example is Teephlow’s “State of The Art” song which won the Record of The Year award at the 2018 VGMA. Also, a good song is memorable. There are things about the song musically or lyrically that stick in the listener’s minds. Another feature that makes a good song is that it is well crafted. The musician puts in time getting the craft right. The structure helps the listener to follow along hence the song is easy to follow and communicates clearly. Good songs are usually products of great craftsmanship. In addition, a good song stands the test of time. A good song will usually be accessible and relevant 10 years or 15 years. There may be exceptions, but a good song sticks around. Besides, a good song must have good production, including recording of vocals, mixing and mastering. To conclude, a good song is a song that many people love due its outstanding production and meaningful lyrics.